What should you know when buying Meldonium. Recently Meldonium reappeared on the world stage of sports in front of the whole globe when one of the Russian athletes tested positive in Winter Olympic Games of Pyeongchang, his name is Aleksandr Krushelnitckii. This again sparked interest among athletes and regular sport spectator like you and me. In this rather small but very useful article about Meldonium , I will lay out the most important things one should know about Meldonium and also will clear some widely spread misconceptions of this interesting substance. This also will help to understand what kind of Meldonium and where to buy if there is such intension. First things first, Meldonium is substance which usually is prescribed or can be freely bought ( it depends on the form of the drug) at local pharmacies for treating heart conditions or just to increase your overall energy levels. It is popular among elderly as well as young adults. Young adults usually take it to recover after stressful periods and periods of overworking. The mechanism of Meldonium workings could be explained in difficult chemical way but in essence this substance enables your organism to use oxygen molecules in more effective way than usual. Now to the most widely spread misconception of Meldonium. Most of you think that Meldonium is manufactured in Russia, but this is not true at all. But I cant blame you because 2 most popular athletes now which have been caught using it, is Sharapova and Aleksandr which both have Russian nationalities. Where then Meldonium is manufactured? It is manufactured almost exclusively in Latvia ( in some languages referred as Lettland) . Latvia is small country which is part of EU and was under occupation of Soviet Russia till 1991. This explains why it is popular also in Russia. 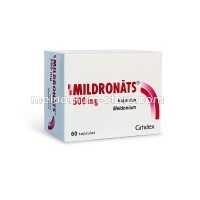 Meldonium under brand name Mildornate ( Mildornats) is made by relatively big pharmacy company Grindeks ( Grindex) which makes the medicine in Riga, Latvia and then distributes it in the region. It is sold in Lithuania,Estonia, Latvia, Ukraine, Belarus and Russia . There is more than one Meldonium naufaturer but there is only one other which is notable because of its Meldonium manufacturing amounts and it is Olainfarm ( Olainpharm) which also is located in Latvia. What types of meldonium there is? 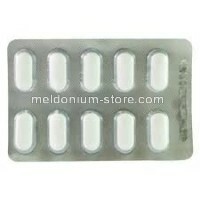 There are several types of Meldonium. There also is a package of 250mg 40 capsules but this one is meant for Russian market, if you buy 40 capsule 250mg pack which is in pink color you know that this is Russian product. 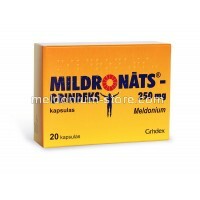 In case of brand name Mildronate 250mg 20 cps package is in yellow color but in case of Olainfarm it is in white and red/brown color. 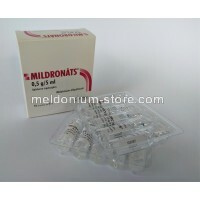 Mildronate 250mg 60cps/500mg 60cps and ampules package is in white color with red lettering. Olainfarm products all are the same with white+red/brown colors. It is highly unlikely that someone would attempt to fake Meldonium because of the price and availability in country of origin and region. However it is advisable to buy from Latvian vendor or Lithuanian at least because it will guarantee, that product is pure and without any unnecessarily additives which could occur in rare cases of knock offs in other countries like Russia. Where can I buy Meldonium? In very rare cases Meldonium listings can be caught in ebay but nowadays it is almost impossible to do that because after some journalist did point out to Ebay that Meldonium is not FDA approved, they banned it form their site also PayPal is not friendly to vendors who sell Meldonium or any other medicines but it wont hurt buyers. Other the Ebay , the best bet would be online vendors from Latvia because they are close to source and they ship from Europe, which makes it a less of a risk that customs will seize it. If you live in Australia it will be a bit harder to find vendor which is willing to ship to you because of the rough customs rules but there is some vendors which are willing to work with Australian and will ship to you using decoy packaging.